HEY! February is a short month, so let's do a Baroque concert and then in 3 weeks give a Medieval / Renaissance concert! "C'mon," they said; "it'll be fun," they said. Darned if they weren't right. I love this stuff! You're going to, too! The Flemish composer Johannes Ciconia, whose professional career as a composer and theoretician was spent almost entirely in the papal chapels and in Padua, represents the next generation of composers in our program. His music is a blend of French and Italian techniques and the result is a style that is uniquely his. The aural effects created by Ciconia’s style of imitation are vibrant and absolutely refreshing! His works “Venecie, mundi splendor,” “Ut te per omnes celitus,” and others will display his jaw-dropping creativity and inventiveness. 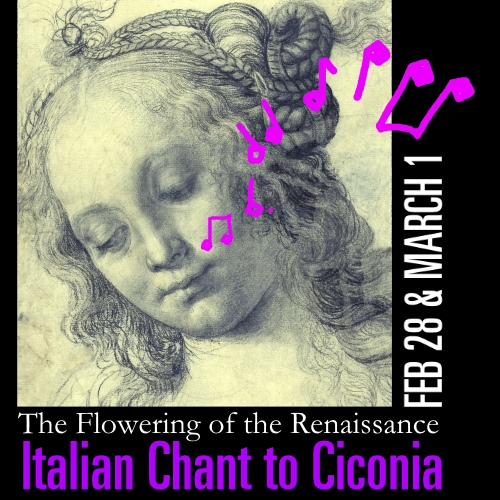 Ciconia’s work in Italy in the early part of the 15th century paved the way for other Lowlands composers such as Heinrich Isaac and Josquin des Prez, both of whom spent major portions of their careers in Italy and helped make Italy the flower of the Renaissance. Isaac’s long-term working relationship with Lorenzo de' Medici established him as the preeminent Florentine composer at the end of the 15th century; his motet “Quis dabit capiti meo aquam,” written to commemorate Lorenzo’s death in 1492, is a truly touching testimonial to his patron. Isaac’s motet from the Song of Songs, “Tota pulchra es,” is among the most beautiful and spellbinding works from the Renaissance. Peter Maund, Bay-area specialist in early percussion, returns for the concert, as will Mary Springfels, renowned virtuoso on Medieval fiddle and viola da gamba. Erin Calata, mezzo-soprano from Seattle, will be the featured soloist in Isaac’s ode to Lorenzo de’ Medici, and will be will be joining TEMP soloists Cayla Cardiff, Jenifer Thyssen, Stephanie Prewitt, Jeffrey Jones-Ragona, Paul D’Arcy, and Daniel Johnson. The complete complement of performers includes sixteen singers and seven instrumentalists (vielles, violas da gamba, recorder, harp, and percussion) for a concert that will be in turns sweetly meditative and rousingly lively, both in the visually and acoustically magnificent space of St. Mary Cathedral and in the much more intimate (and acoustically renovated) First Presbyterian Church. Join us for wild and saucy dances fit for Boccaccio's Decameron, shimmering and bold works by Ciconia, and progressive and iconic motets by Isaac. Experience the expressive beauty of the Renaissance blooming across Italy.